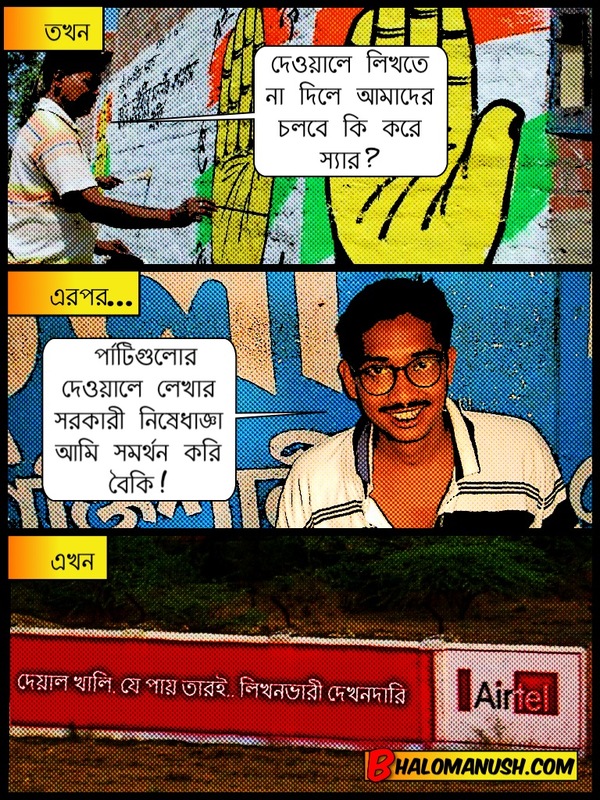 This entry was posted in বাংলা, বাংলা কমিক্‌স, হাসির ছবি, Bangla, Bangla comics, Bengali, Bengali comics, funny Bangla pictures, funny Bengali pictures, funny clips, picture perfect!, Regular features by Anirban. Bookmark the permalink. Hilariously threaded! Photography ki Bhalomanusheri? Fatafati namche .parle ekta boi chhapiye felo.loke definitely khabe. Naru r statement support korchi,mug ba t-shirt eo valo jombe. Ek je chhilo sheyal\ tar bap likhchhilo deyal;\ lekhar dapha rapha,\ (ekhan) shudhui mala japa,\ (se je) ghas phuler mala\ (tai to) oder gaye jvala.\ Tar netar nam Rata,\ phurulo amar katha! Onobodyo… ei choRati ki aapnar lekha? The original is by Abanindranath in একে-তিন তিনে-এক, so far as my memory goes. It ran just two lines: এক যে আছে শিয়াল/ তার বাপ দিচ্ছে দেয়াল/ তার বাপের নাম রতা/ ফুরুলো আমার কতা. I’ve embellished it a wee bit. The praise should be rained either on Bangla folk-rhymes or on AN Tagore, I’m none too sure who deserves more.